Puteți să stabiliți o culoare sau o imagine drept fundal pentru fiecare dosar și Desktop pentru fiecare spațiu de lucru. The top menu specifies if your changes are applied to the current workspace only, all workspaces, a specific folder or as default for every new folder. Below that you can assign an image or select None if you want simply a colored background. Images can also be drag & dropped onto the preview to the left. Manual lets you specify the coordinates. You can drag the picture around in the preview to the left or enter X and Y manually. Centru centers the picture in the middle of the screen. Scalare la potrivit enlarges the picture with no regard to its aspect ratio until it fills the screen. Mozaic fills the screen by repeating the picture. Activating Icon label outline puts a thin contour around icon labels. The selected color is also reflected in the Workspaces applet, which ignores images as backgrounds. 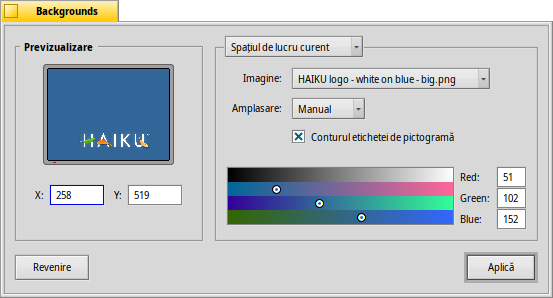 Revenire aduce înapoi configurările care au fost active atuci când ați pornit preferințele Backgrounds.